Opposition MPs and a section of NRM legislators opposed to the lifting of the presidential age limit surrounded the Clerk's table as they sung Uganda's National Anthem. Courtesy Photo. Parliament will sit this afternoon to consider the Raphael Magyezi motion a day after Speaker Rebecca Kadaga adjourned the House amidst chaos. The chaotic scenes in Parliament yesterday made it impossible for the Igara West MP to table his motion seeking leave of parliament to introduce a Constitution Amendment Bill to pave way for the amendment of Article 102 (b) of the constitution, which caps the presidential age at 75. Kadaga had to adjourn the House sitting to 2pm today after Opposition legislators disrupted proceedings. For the second time in five days, legislators got up and started singing non-stop in an attempt to block the Raphael Magyezi motion which the speaker had scheduled earlier in the day. “House adjourned to 2pm tomorrow,” said Kadaga, as the opposition members broke into wild celebrations. 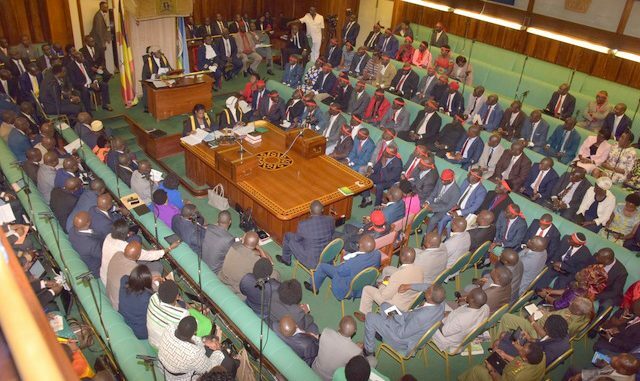 At 1:20pm, Members of Parliament from mainly the ruling National Resistance Movement (NRM) party and Independents started taking up their seats in the Chambers. 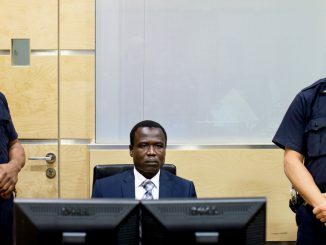 As other MPs continued walking in to the Chambers, the Sergent-at-Arms Ahmed Kagoye was seen at 1:54pm directing his assistants to shift the Mace, a ceremonial symbol of authority, from its usual clerk’s table to the Speaker’s table in what appeared as a move to prevent a scenario where those opposed to the motion, could confiscate it. At 2:05pm, Opposition MPs with red ribbons around their heads, holding hands in what appeared as a chain made their way into the Parliament Chambers as NRM MPs laughed off their presence chanting order, order. 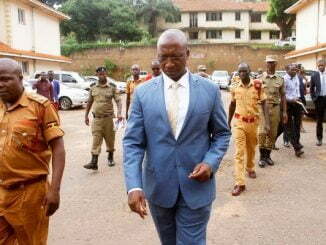 Just after the Opposition MPs made their way to the Chambers, Prime Minister Ruhakana Rugunda, his deputy Moses Ali and Government Chief Whip Ruth Nankabirwa also entered the Chambers at 2:17pm. At 2:18pm, Government Chief Whip Ruth Nankabirwa was seen engaging the Sergent-at-Arms Ahmed Kagoye behind the Speaker’s chair before the sitting started. At 2:30pm, Igara West MP Raphael Magyezi made his way to the Parliament Chambers attracting applause from the NRM MPs with others shaking his hands as he smiled before splashing the thumb sign. The NRM MPs continued praising Magyezi chanting slogans such as ‘Our Man, Magyezi’ until he found himself a seat on the third bench. Magyezi’s entrance was immediately followed by the Leader of Opposition (LOP) Winnie Kiiza who entered the Chambers at 2:35pm. At 2:37 pm, Speaker Kadaga was ushered into a fully-packed House and immediately asked the Opposition MPs to remove their red ribbons after the parliament prayer was read. “Before we proceed, I know that some of you enjoy bright colors but I want to ask the members on this (opposition) side to remove their bandanas,” said Kadaga. With this directive, the Opposition MPs signaled by LOP Kiiza all stood up and removed their red ribbons with some male MPs turning them into pocket handkerchiefs. At 2:43pm, Kadaga continued with her communication to the House notifying MPs that she would be amending the day’s Order Paper to allow eligible motions filed with her office to be presented. Among the motions she allowed was that of MP Magyezi. With this communication, LOP Kizza at 2:55pm raised a point of procedure questioning the manner in which the controversial motion was being presented to the House. She was however overruled by Speaker Kadaga forcing her to sit down. Following this ruling, chaos ensued on the floor of parliament immediately with Opposition MPs claiming presence of guns in the Chambers which accusations escalated into the exchange of punches between legislators, bringing parliament business to a stand still for over 20 minutes. Opposition MPs pointed fingers at State Minister for Water, Ronald Kibuule, saying he had a weapon inside the Parliament Chamber. At 3:29pm, Opposition Chief Whip Ibrahim Ssemujju Nganda pinned Minister Kibuule claiming that he had entered parliament with a gun prompting Speaker Kadaga to direct a search of every MP. 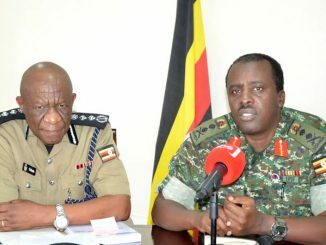 Following a search conducted by the Sergent-at-Arms that lasted over 15 minutes, Speaker Kadaga at 3:44pm communicated that all suspected areas had been searched revealing no existence of guns. She demanded the MPs to stop playing delaying tactics asking Energy Minister Irene Muloni to proceed with the business of the day. The statements from ministers went on for the rest of the afternoon with calmness until 7:05pm, when Clerk to Parliament Jane Kibirige called for the tabling of the now controversial age limit motion sparking off chaos. At 7:10pm, Shadow Minister for Justice Medard Lubega Sseggona demanded that they should not be ambushed with Magyezi’s motion since there was an earlier motion filed by Kassanda North MP Patrick Nsamba demanding for a constitution review commission. However, Speaker Kadaga insisted that Magyezi’s motion be tabled since it seeks to present a bill before parliament. At 7:16pm, Lwemiyaga County MP Theodore Ssekikubo challenged the Speaker saying that there was no bill yet in parliament and that all motions needed to be handled fairly. With Kadaga determined to have Magyezi’s motion tabled, Opposition MPs once again stood up putting on their already banned red ribbons and started singing the National Anthem non-stop despite calls from Kadaga to keep order. Left with no option, Speaker Kadaga adjourned the sitting to Wednesday 2:00pm when the matter is expected to resume, the same thing her deputy, Jacob Oulanyah did on Thursday last week under similar circumstances.